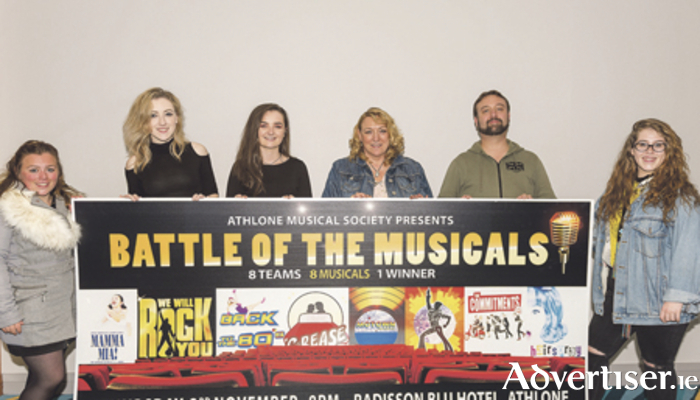 On Wednesday, September 14, Athlone Musical Society launched ‘Battle of the Musicals’ in the Radisson Blu Hotel, Athlone. Battle of the Musicals is the society’s first fundraising event of this kind. You have seen Strictly Come Dancing and Lip Sync Battles; now it is time to see eight teams dance and sing live on stage. Featuring a cast of 80 local personalities, some new to the stage and some not, they will dance and sing their way through famous songs from Broadway’s best musicals. Working with musical director, Enda O’Connor, and choreographers, Tanya O’Brien-Reid and Sinead Hensey, eight teams of 10 participants will each represent a musical and compete against each other. Enjoy famous hits from Mamma Mia, The Commitments, Saturday Night Fever, Grease, We Will Rock You, Motown, Hairspray, and Back to the 80s - all in one night. The winning team will be picked based on the audience vote on the night and also on their score given by our panel of expert judges. Speaking at the launch last Wednesday, committee chairman Tony Dalton thanked all the participants for attending and “for offering their time to take part and showing their enthusiasm to get up on stage”.